Fig. 1. 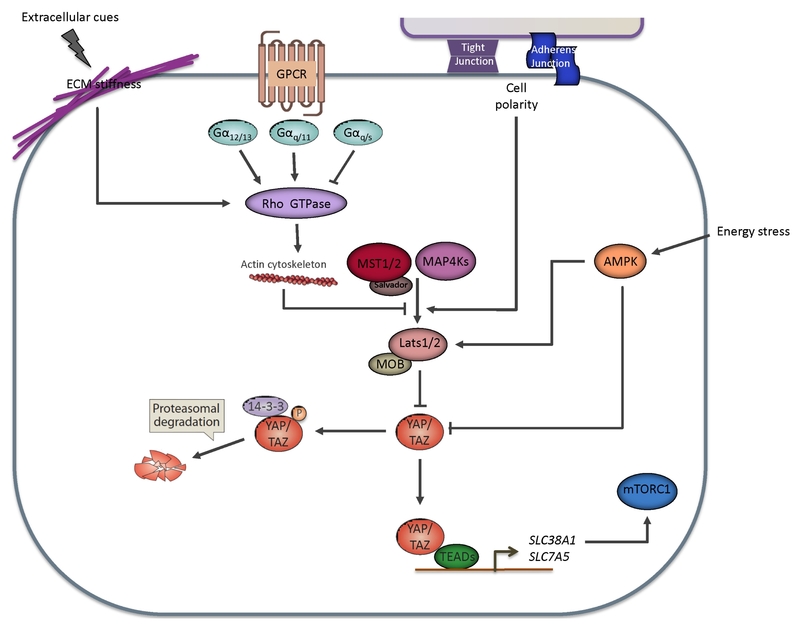 Regulation of the Hippo-YAP pathway by extracellular biophysical cues. Mechanical stress inhibits Lats1/2 kinase activity via Rho GTPase and the actin cytoskeleton. GPCR signaling can either activate or inhibit YAP/TAZ activity through the coupled Gα protein. Cellular junction and cell polarity modulate the Hippo pathway. Nutrient signaling modulates the core Hippo kinase and YAP activity through AMPK. YAP/TAZ activity is involved in amino-acid induced mTORC1 activation.